This spinach soup is an easy soup recipe that you can quickly make any night of the week. It’s also a very healthy soup recipe, packed with nutrients from fresh spinach and onions. I love that this is such a simple soup recipe, full of wonderful flavors and yet still delivers such a nutritional whallop. And because the soup is whizzed in a blender before you serve it, you may just be able to pass it off as something else other than spinach to the kids or other picky eaters in the house. Gotta get vegetables into them in some way, right? Brown the onion in butter. Add the broth, salt and rice. Simmer, covered, for 45 to 50 minutes, or until the rice is tender. Add the spinach and simmer 6-8 minutes. Process the cooked soup in a blender or food processor until the soup is smooth, then pour it back into the pot. Combine the milk and eggs in a small bowl. Add a few tablespoons of soup to the egg mixture, then stir the egg mixture into the soup. Heat through. Add the lemon juice and pepper. If you think the soup is a bit thick, simply thin it with extra milk. You can also replace the milk in the recipe with an equal amount of milk substitute – any of almond milk, rice milk, soy milk or coconut milk would work well. I think coconut milk would add fabulous flavor to the soup. Of course you can always substitute white rice for the brown. 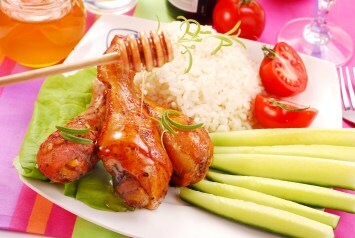 White rice only needs about 20 minutes max to cook, so cut the cooking time from 50 minutes to 15. The rice will continue to cook after you add the spinach. You can even replace the rice with another grain, such as amaranth or quinoa. Substituting vegetable broth for the chicken broth called for in the recipe is an easy way to make this a purely vegetarian soup. It really is important to add just a bit of the soup to the egg mixture before you combine it all together. The soup will be piping hot and if you add the egg mixture to it all at once you will end up with spinach soup with scrambled eggs. Adding just a bit of the soup to the egg mixture first warms the egg and gets the temperature a bit closer to that of the soup. Then, when you mix it all together, the egg won’t clump and cook. It will result in a nice silky texture. One pound of spinach may sound like far too much, but it wilts down so much once it begins to cook that the result will be perfect. Check out the nutritional values in this recipe (shown in the blue box above). This simple, easy soup recipe is a powerhouse of healthy goodness. Just one small serving – one cup – gives you more Vitamin A than you need in your entire day, a whopping 39% of your Vitamin C requirement and lots of calcium, iron and potassium, all while keeping the calories down. This fabulous soup makes a very healthy dinner recipe. Just add a side salad if you want, plus a piece of good bread and I know I’d be in heaven. 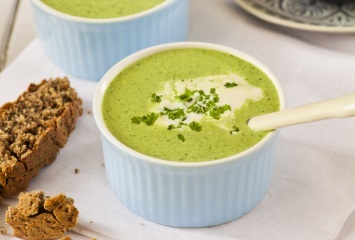 This healthy spinach soup is one of our diabetic recipes. If your body is particularly senstive to carbs, please omit the brown rice or use just half the amount. You can also replace it with a higher protein grain like quinoa. If you enjoy this wonderful spinach soup, share your comments below. I’d love it if you sent in your own healthy soup recipe too. Let’s share your healthy creations with others. If you like this spinach soup, browse our other spinach recipes here. You may find a new favorite recipe.